Interviewer: The Magna Carta – was it a document signed at Runnymede in 1215 by King John pledging independence to the English barons, or was it a piece of chewing gum on a bedspread in Dorset? The latter idea is the brainchild of a man new to the field of historical research. Mr Badger, why – why are you on this programme? In the last tutorial we created a file using our text editor and saved a function to it. This file was called trivia.py and in it was the module “trivia”. We then started Python in a console and import()ed the trivia module. Once imported, it created a “namespace” and we could access the askQuestion() function from within the trivia namespace by using a dot – trivia.askQuestion(). In order for the module to work properly we had to include an import statement within the module itself so that everything that the module relied upon was imported within the module. We then manually loaded our data from a pickle file we created and, manually, ran the askQuestion() function on the first question in our data store. Finally we added docstrings to the function and the module. In this tutorial we’re going to try to do much the same thing again, but without using the Python interpreter. That is, we will need to take the things we did in the interpreter and implement them in our trivia.py file. We will have a functioning (although still quite simple) stand alone Python program. To start, open up trivia.py in your text editor. Looking at the last tute, we can see that we used the cPickle module, so that will need to be imported. We then opened the existing pickle file, and loaded the stored pickle. # trivia namespace. If you put trivia.askQuestion, the code would not work. Who expects the Spanish Inquisition? 3 . What do you mean? African or European swallow? Cause the program it iterate through each element in the list questionsList and, for each element, to call the askQuestion() function with that element as a parameter. If you remember, each of these elements is, itself, a list. Bonus points: actually change the program so that it keeps track of the player’s score and prints out the score after all questions have been asked. QUESTIONS_FILENAME is a variable, and ‘p4kTriviaQuestions.txt’ is the constant. However, in the text I’m referring to the variable as if it was the constant. 2. Actually, when you run a program from the command line Python reads the whole file and pre-compiles it first (or uses an existing pre-compiled version if you haven’t changed the file) then runs the pre-compiled version. Have a look for file called trivia.pyc in your directory. The place for a doctring which was an exercise for you to complete in the previous tute. Second Interviewer I didn’t really call you Eddie-baby, did I, sweetie? Ross Don’t call me sweetie!! Second Interviewer Can I call you sugar plum? In this tutorial we’re going to start using the power of the text editor that I’ve been badgering you about over the last few tutorials. We are going to go back to the earlier tutorials and resurrect some of the code there. Save the document to a file called trivia.py You need to be careful that your text editor doesn’t add ‘.txt’ to the end of the file’s name as some have the habit of doing. However, doing this is frowned upon because it ‘pollutes’ the namespace. In particular, you may end up with collisions between functions imported into the namespace. So if you have two modules, each with the a function of the same name, but of different effect the interpreter would have a problem if you from imported both of them. Try to avoid using the import from syntax at least until you’re familiar with why it’s a problem. Now, the important thing to note is that we were able to change part of the function without retyping all of it. Going forward we will be able to extend this module by adding bits to it. Create a docstring for the trivia module itself, describing what the trivia module will be doing (make a list of the things you think it should eventually do in order to make a trivia game). Work out where the docstring needs to go in trivia.py. Save the file, then reload the module from the Python prompt and print the docstring out. Think about what part of the Python language we might use to ask all of the questions stored in the pickle file, rather than just the first one. He then goes underwater again. The servant in the boat steps into the water and goes under. Cut to announcer, now up to his waist in sea. In this tutorial we review what we have covered over the last few tutorials, and lay some more groundwork for working with files and using the text editor that you organised in the last tutorial. pickling basics: we learnt about a way of storing data called “pickling”. We did some basic pickling. Pickles are a way of storing data. This means that, in our trivia quiz, we’ll be able to add questions from time to time, without having to retype all of the questions we have added earlier. pickling data: we took our understanding of pickles and applied it to our data. We saw how we can save the data that we were using for our game into a file for later use. introspection: Python objects are able to tell you about themselves. In particular we learnt about the .__doc__ string and the dir() functions. Introspection allows us to find out stuff about the program we are working with. In some cases it can be a sort of help file by telling us some stuff about an object. Introspection is part of Python ‘for free’. It is available whenever you run Python without having to (eg) import introspection in the way we imported cPickle. more on pickles: how to load data that’s been stored in a file, modify it and dump it back to the file. So we can keep data that our programs rely on in a file. The point of this tutorial was to show how the pickle can be used like a locker for your data. If you put your data into a pickle not only will it be there for you to take out later, but you can take it out, change it, then replace the old data with the new data. in the most recent tutorial, I told you to go get a text editor and learn the basics of how to use it. Using a text editor will allow us to store the Python code that we are writing in much the same way as we have been saving data in the other tutorials. One of the benefits of this is that we don’t need to retype code all the time. If we want to modify a function we just open the text editor and modify it – without having to retype it from scratch. Most of the things we’ve covered here have to do with files and (therefore) the file system on your computer. In order to do further tutorials we’re going to be changing the file system, and if we do that we’ve got a problem in that we may end up deleting or changing something we didn’t want to. For that reason I’d like you to talk to a responsible adult and set up a separate folder on your hard drive specifically for these tutorials. 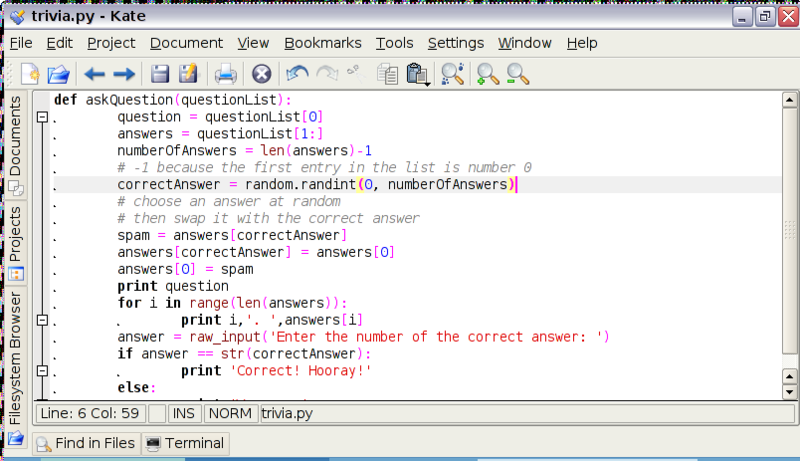 Call it python4kids (or p4k if you are a lazy typist). Homework: have a responsible adult set up a separate folder (also called a directory) for these tutorials. Name it python4kids or p4k. Homework: work out (ask someone or Google) how to change directory into this new folder so that any files you make are made here. Whenever you run Python change directory to this folder first, so that Python runs in the directory. Homework: work out how to load files from this directory using your text editor and how to save files to this directory using your text editor. Homework: Copy the pickle file we’ve been working with to this new directory. If you have not made any or many additions to it, you can just recreate it by running the tutorials in the directory. If you do these things and whenever you do these tutorials you do them in that folder, saving files to that folder, then I don’t have to worry about accidentally overwriting your other data, because the only data that will be there is data we’ve created in these tutorials. There is a big one which is still missing – classes. We will get to classes in a few more… classes. Till then… do your homework.